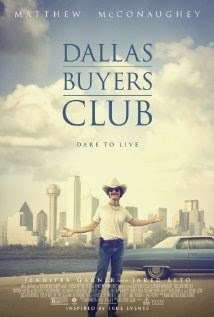 Plot Summary: Matthew McConaughey stars in "Dallas Buyers Club" as real-life Texas cowboy Ron Woodroof, whose free-wheeling life was overturned in 1985 when he was diagnosed as HIV-positive and given 30 days to live. These were the early days of the AIDS epidemic, and the U.S. was divided over how to combat the virus. Ron, now shunned and ostracized by many of his old friends, and bereft of government-approved effective medicines, decided to take matters in his own hands, tracking down alternative treatments from all over the world by means both legal and illegal. Bypassing the establishment, the entrepreneurial Woodroof joined forces with an unlikely band of renegades and outcasts - who he once would have shunned - and established a hugely successful “buyers’ club.” Their shared struggle for dignity and acceptance is a uniquely American story of the transformative power of resilience.